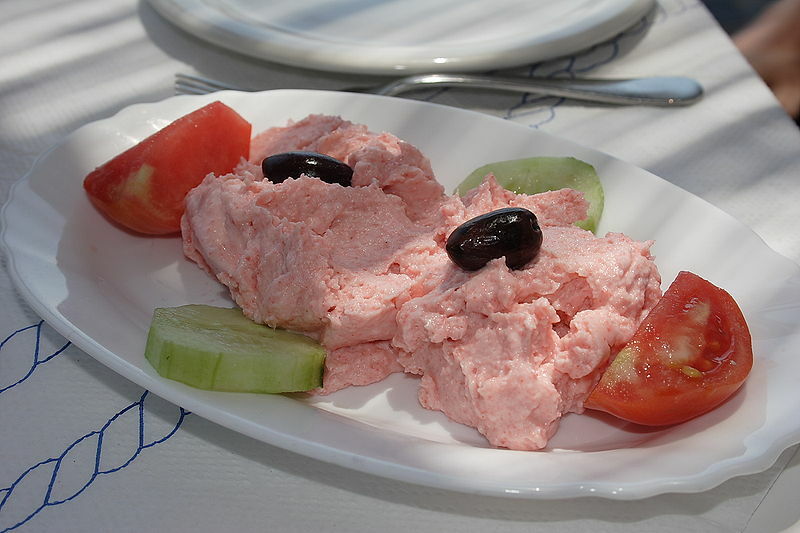 Taramosalata (Greek: ταραμοσαλάτα, from taramas (from Turkish: tarama) + salata "salad" is a Greek and Turkish meze. The alternative spelling 'taramasalata' is sometimes found. Left: A plate of taramosalata garnished with cucumber, olives and tomato. It is traditionally made from taramas, the salted and cured roe of the cod or the carp, though blends based on other forms of fish roe, particularly cod, have become more common. The roe is mixed with either bread crumbs or mashed potato, and lemon juice, vinegar and olive oil. The colour can vary from creamy beige to pink, depending on the type of roe used. Mass-produced taramosalata is often a bright pink due to the addition of food colouring. It is usually eaten as a dip, with bread or raw vegetables.